Athletes are always looking at ways to improve their efficiency, and one of the best ways to improve performance is to figure out recovery time and therefore the most opportune moment to exercise. RocketBody's AI wearable, available on Kickstarter for $99, is aimed at helping an athlete do that with the use of an EKG sensor. The wearable is actually one part of a two-part system, with the other half being the companion app. Eugene Zolotariov, RocketBody's COO, tells Wareable that a user should take their EKG four times a day: morning and night, plus before and after a workout. RocketBody's algorithms will then take those EKG readings and determine metabolic rate. The metabolic rate is combined with the app's other features, like workout and meal plans, to help determine how you can perform most efficiently. Before you get workout and food information though, you have to input your own data. The more data you input to RocketBody, the better the suggestions and tailoring it gives back. RocketBody can also tell you when your body will be at peak performance, a metric RocketBody is referring to as supercompensation. Zolotariov says that peak performance is difficult for athletes to attain, as for some people it can last a couple of hours but for others it can be as short as two minutes. 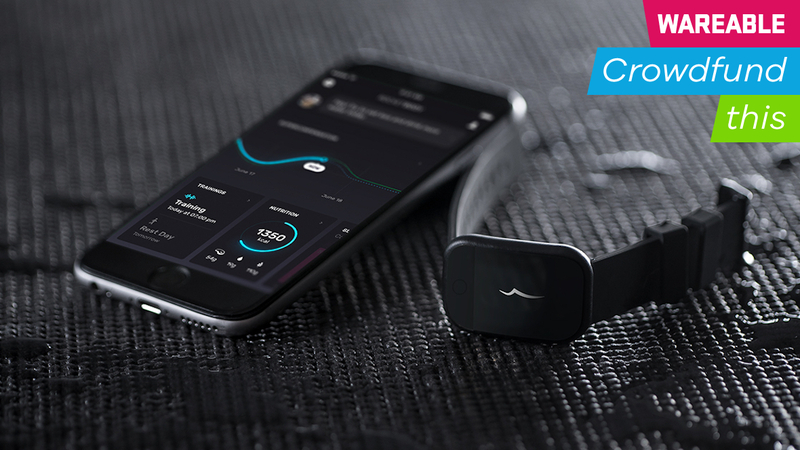 The company is also looking to add stress and sleep tracking, but those features aren't ready yet. For now, it'll focus on helping users figure out metabolic rates and coaching them on how to attain their fitness goals. All of which is resting on RocketBody's EKG sensor. "EKG and metabolic rate are the most accurate metrics for athletes. So of course there are other metrics that play a big role in the life of an athlete, but metabolic rate is something that helps athletes track their recovery process," he says. This then puts them in the optimal position to perform at their best when needed. EKG sensors typically measure 12 "leads" of your heart, but RocketBody's is only measuring one. "For diagnostics of heart diseases and so on, all 12 leads are required. But in order to define metabolic rate and metabolism and in order to track heart rate variability, one lead is enough," Zolotariov says. RocketBody uses a neural network to combine a host of metrics, from heart rate to heart rate variability to calorie input and output and more, all to help determine your metabolic rate with its patented algorithms. Zolotariov says studies conducted in eastern Europe have shown a link between EKG and metabolic rate. EKG changes have also been linked in the past to hyperkalemia, a condition where someone has high potassium. The company is also not going to be applying to the FDA to get its EKG sensor approved, as the AliveCor KardiaBand did. Why? "It's not a medical product and it's not supposed to be," Zolotariov says. "We're in the area of fitness and healthy lifestyle." Good question – thanks for asking. Zolotariov says RocketBody recently received a round of funding and doesn't actually need any money to produce its wearable or its app. In fact, the wearable is "99% ready" to ship. The company's also gearing up for another investment round. So Kickstarter is more of a marketing tool, especially in the US, where RocketBody feels EKG readings haven't really taken off yet – though Zolotariov acknowledges it's a growing trend. RocketBody looks at its Kickstarter campaign, which is fully funded to the tune of $47,794, is more like the first round of sales before it goes into full production. Whether you should pitch up and join in depends on how serious you are about working out and athletic performance. A lot of athletes would benefit from a system that can not only tell you when your peak performance is coming but what workouts to do and what food to eat – especially if stress and sleep tracking is on the way. If the 50% Kickstarter discount feels more like an impulse buy for you, and you're that serious about athletics, then trying out the RocketBody feels like a no-brainer for the price. But we can't yet speak for its accuracy or effectiveness. You can be sure we'll be trying one out at the first opportunity.